Homo sapiens’ relationship with Canis lupus goes back almost to the beginning of prehistory. That relationship is based as much on rivalry as it is on mutually beneficial interaction. Somewhere along the line, though, humans and wolves parted company and that parting has resulted in the virtual extinction of the wolf, not just in Wales, but also in England, Scotland, Ireland, and most of Europe. As well, the wolf became in the popular imagination a monster into which the human may transform when conditions are right and wreak havoc throughout the landscape, maiming and killing the hapless traveler and spreading contagion in his path. The legend of the werewolf. 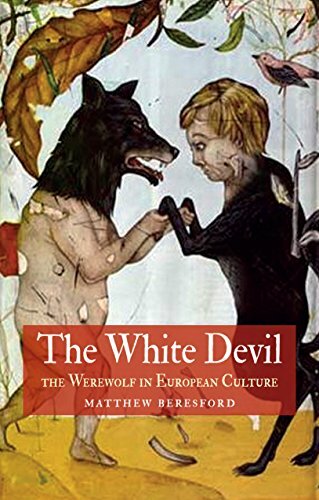 If anyone doubts that the werewolf is a subject for serious study, one only has to read a few chapters of Matthew Beresford’s The White Devil to have all doubts removed. For those of us who love tracing myths and legends back to their origins, The White Devil is manna from Heaven. Beresford writes that the wolf was at one time both rival and ally to early man. Where the bear may have been one of the first totem animals, the wolf was the most lasting. Perhaps this is because it, like man, tended to live in hierarchical packs, to hunt in cooperation with each other, and to share the spoils of the hunt. Beresford maintains that the two species recognized each other’s hunting skills and became a natural “fit,” each making up for the deficiencies of the other. Many scholars say that these rituals were the beginnings of the theater—not Shakespeare, to be sure, but still effective for its audience. So effective in fact that the shaman wearing the mask and skin of the wolf could have actually believed himself transformed, no doubt with the aid of some hallucinogenic sacral drugs, becoming the animal he signified, snarling, howling and loping bout the fire. In the classical world, transformation into animals was a commonly held belief. Perhaps the most famous of these transformations are found in Ovid’s Metamorphosis. Even in civilized Rome the changing of one’s form was not out of the question—and it wasn’t necessarily always a bad thing. Yet at some point in the history of man’s relationship with the wolf, it went sour. At first, the wolf was a natural ally, but it turned into an enemy and was hunted to extinction, in the meantime gaining an unearned reputation for savagery and violence. Unearned, because as Beresford points out there were few incidents of attacks by wolves on humans, and on those rare occasions when a wolf went rogue, the pack destroyed it for the sake of the pack. This is another way in which the wolf resembles the human. The change in the wolf’s reputation probably happened when man began to herd animals instead of hunting them. The wolf didn’t get the memo. To the wolf, livestock was still prey. So by the Mesolithic Age (10,000–5,000 BCE) the wolf and Canis lupus familiaris, the domesticated dog, parted company. The sheep dog was eventually employed to protect the flocks from its errant cousin, and the wolf became an object of loathing. Beredsford goes on to trace beliefs and cases of half man, half wolf through the middle ages where it was linked to witchcraft and vampirism in terms of devil worship and those who claimed to be or acted as if they were any of these were burned alive. He moves forward into the seventeenth and eighteenth centuries where Lycanthropy was the product of drug induced trance or mental illness, and where the werewolf started to be seen in popular fiction, most notably in the character of Renfield in Brahm Stoker’s Dracula. The contradiction of the werewolf legend was proffered by Darwin. No, he said, it is impossible for one species to physically transform into another. Spoilsport! The White Devil is informative and entertaining, filled with grisly anecdotes and case histories, religious, social, and medical interpretations, both credible and laughable. It leaves us wanting to know more. This is serious scholarship expressed in an easy, readable prose that examines the phenomenon from its beginnings with the tribal shaman all the way through to the legend’s popularization in film and television. The White Devil is a suitable accompaniment to Berensford’s The Black Devil that traced the history of the vampire. But where the vampire is an external force that acts upon the human being, the werewolf is internal, calling forth our most ferocious inner beast. a playwright and taught drama at North Dakota State University. He has also been a television journalist and arts critic.